I have been getting over a cold recently and have used that old remedy from my Mother of taking honey and lemon in tea. Honey is just an amazing liquid and I wanted to share some healthy facts about it. Raw unprocessed buckwheat honey has natural antioxidants. According to a University of California study, raw honey taken by mouth and not dissolved can raise the level of antioxidants in the bloodstream. 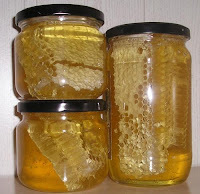 Raw honey is also known as a wound healer. It was used long ago and a topical anti-bacterial agent. It also reduced inflamation and reduction in pain. It also helps with quicker healing and minimal scarring. These many attributes have been re-discovered recently. In other studies, honey positively affects cholesterol and is the healthiest sweetener. All good things and more from this golden liquid in its raw state. Does it helps to dust allergy? No I don’t think so. For me it was soothing when had cough.